Ocean's Edge Ministries is a Christ-centered non-profit association established to positively impact the world by helping others live the abundant life through a personal relationship with God and a mission lifestyle. We accomplish this by mobilizing volunteers to positively impact the world for the glory of God, facilitate growth through mentoring & training, and hosting like-minded ministries, teams and individuals on The Edge Ministry Base. Stay up to date: Follow us on facebook (click here). 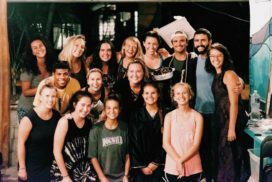 Looking for a Mission Trip to Costa Rica? The OEM Missions Program aims to promote missions as a lifestyle as they use their God-given gifts and passions. Click here to join or run a missions trip! The Short-term Missions Program gives individuals a chance to use their God-given gifts and passions in various ministry settings. Read more about the Individual Short-term Missions Opportunities! Let us know you are out there & how you would like to get involved. Join us as we step out in faith to live a missions lifestyle!